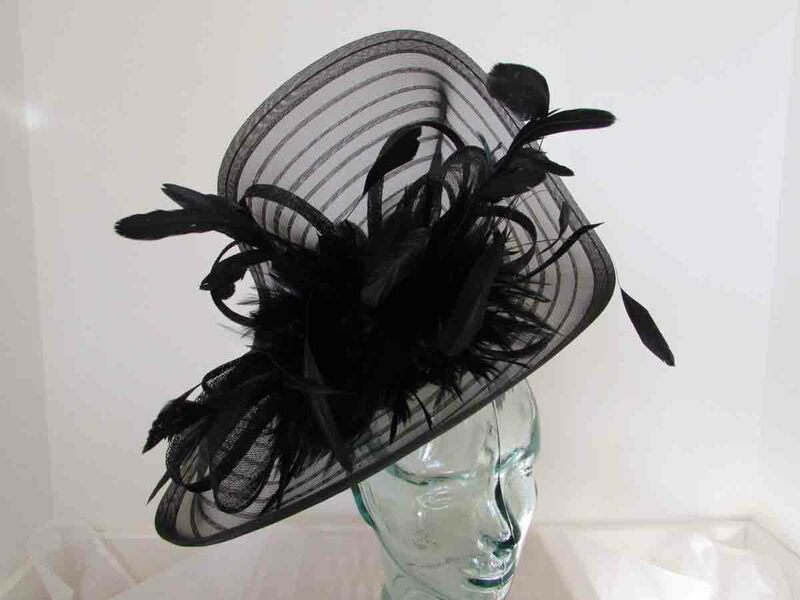 Pleated crin fascinator with busy feathers and sinamay loops, sitting on a pillbox in black on an aliceband. Matching clutch bag also available. We aim to dispatch all orders within 48 hours after payment has been received, and once an order has been dispatched we will then update your order and you will receive a notification regarding the update. Please see our returns page for further information on our returns policy. Sinamay hatinator with silk trim and detail in black and white , on an aliceband. Large crin fascinator, edged in satin, with crin and satin loops on a band in black. Matching clutch bag also available. Net black fascinator with wired edge, large dramatic flower and loops with green feathers on a fitted alice band. Looped sinamay fascinator on an aliceband in black, matching bag also available.